Dominique Antiglio is a Sophrologist specializing in stress-management, self-development, and birth preparation. Born in Switzerland, Dominique started Sophrology at fifteen years old, learning early ways to positively connect with herself and embrace a new way of living. At twenty-five, she graduated from the renowned European School of Osteopathy in Kent obtaining her Bsc(Hons) Ost. She returned to her native hometown and ran a successful osteopathic clinic for a decade, as well as specializing in treating children and pregnant women in France and the US. At the same time, she continued her personal development journey with Sophrology and trained as a Sophrologist. Dominique gained her Masters in Caycedian Sophrology (2006), notably training with Professor Caycedo, the founder of the method. Passionate about the mind-body connection, she also explored the power of sound and obtained her Holistic Voice Diploma in 2013 in the UK. 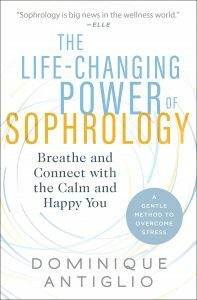 Sophrology combines relaxation, breathing, gentle movement and visualization to help you connect with yourself and find the strength you never knew you had. Today’s world can be extremely challenging due to working long hours, feeling under pressure, trying to keep work-life balance, or to maintain a healthy lifestyle. It is easy to become stressed, struggle with anxiety, encounter sleep problems or lose confidence. Sophrology is widely acknowledged as a tool that can help to enhance physical performance by priming the mind mentally. Exams, sports competitions, presentation or surgeries, we can prepare the mind and body to stay calm and centered in these situations so negative stress doesn’t take over. That way, we are as free as possible to perform. We use a combination of body awareness exercises and visualization to help prepare every aspect and train our resilience for any situations.